You will begin by completing the class name and description. All fields with a * are mandatory. Age – This is the Age range the class is designed for. To set the categories for your school go to Admin->School Setting Types->Age Groups. Color – the color assigned to a class, appears on the homepage calendar. It can be used to designate a teacher, classroom, etc. If the preference is to not assign a color, select white. Drop in Class – check this box to accept drop in enrollment by the day. Status – ACTIVE is a live class, INACTIVE is a class that is not currently active, and DO NOT SHOW is an Active class but prevents the class from appearing to a parent login in onlie registration or in the portal. Start and End Dates – The dates define the time period of the class. They are defaulted based on the season but can be overridden. Teacher – This is the main teacher assigned to the class. Select one from the drop down menu. Additional teachers can be added from the teacher tab. 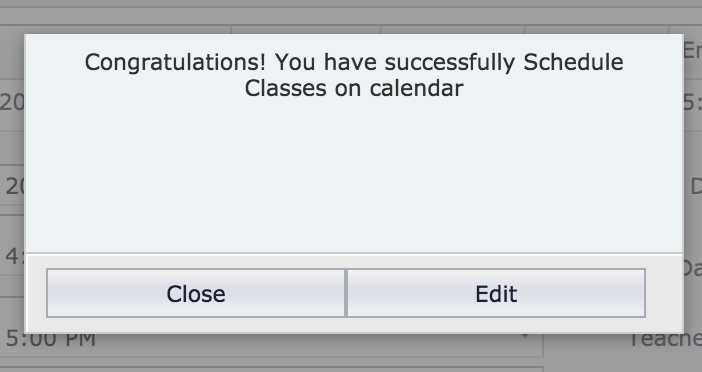 Lastly, click SCHEDULE to save class and auto-schedule onto the calendar. You will receive a confirmation box. You can click close if you are finished or edit to make any changes.